Rainier Fruit provided me with apples for recipe development and a great prize package for our readers as part of #AppleWeek. All opinions are my own. The crunch of fresh apples, the sweetness of dried cranberries, savory chicken and cheese, and fresh greens come together in this great salad that helps bridge the seasons when you still want something light but fall flavors are calling your name! The homemade dressing is perfect for all kinds of salads as well! This time of year is always interesting to plan dinners for. I have eaten my weight in fresh tomatoes from the garden and I am ready for something different. There is a nip in the evening air that makes you think fall, but it is still too warm to actually make casseroles and braises. Besides we are still busy taking advantage of daylight, so I am not yet ready to spend the time assembling lasagnas after work. The time for apple cider pulled pork and yummy chicken enchiladas will come soon enough. Those warm, comforting meals will start hitting the table as soon as the cooler weather is here to stay and really I can't wait! In the meantime, a nice fresh salad that incorporates some fall flavors is a perfect way to bridge the seasons. If you have some leftover chicken, they come together in no time. I was super excited when Rainier Fruit signed on as a sponsor for #appleweek. Any fruit I've had from them has always been amazing. When I heard they were waiting to send us apples until honeycrisp season started, I probably let out an audible squeal! I just love honeycrisp apples. They have that great crunch and the perfect balance of sweet and tart. Thet actually overnighted us a nice box of organic apples just as picking season started so we could have the freshest produce to create recipes with. Isn't that amazing? Since I love the apples so much, I really wanted them to shine in my recipe. I also new I wanted to keep them raw so that crunch that earned them their name would remain. So I put together a delicious salad for you. The dressing only takes a couple of minuted to assemble and it keeps well. Just out the ingredients in a jar and shake them up. Store it in the refrigerator and shake it again before your next use. Easy peasy! Now I served the first salad with some leftover smoked chicken breasts I had and that was amazing! I am always a bit nervous serving something like this to my husband as he is kind of your classic meat and potatoes (preferably with plenty of cheese) kind of guy. He gobbled it up and told me I could make it again anytime. That's his way of saying he likes something. So you know what I did? I made them again the very next weekend and every day that week for my lunches as well! This time I just quickly cooked up some boneless skinless chicken breasts and chopped them up. 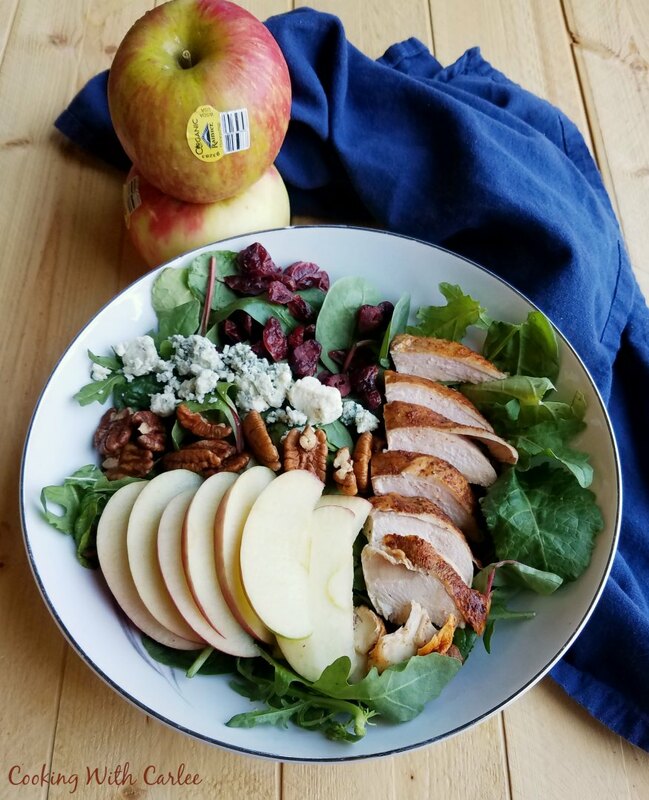 The sweet apples and dried cranberries paired perfectly with the savory chicken and nutty pecans. The dressing has a nice balance of sweet and acid that jazzes everything up a bit. We love the flavor the bleu cheese adds to a salad like this, but if you aren't a fan I'm sure feta, cheddar or gruyere would work as well. If you are a big fan of salads like this that are loaded with fruit, nuts and cheese you are going to love some of my other salads as well. 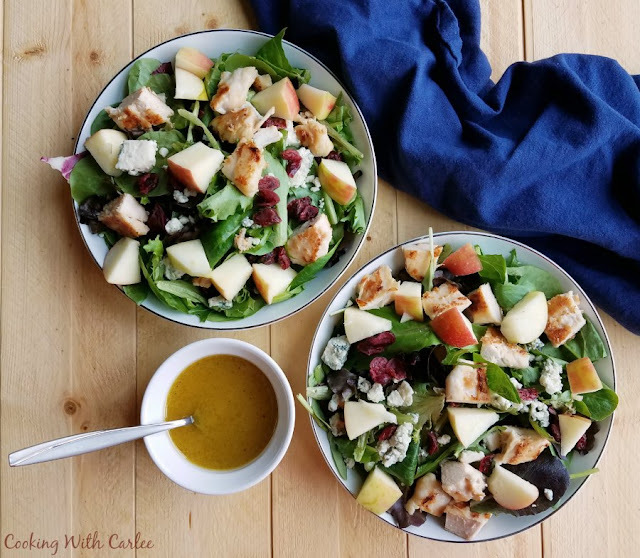 The fruit and chicken poppy seed salad is stuffed to the gills with goodies and a homemade poppy seed dressing brings it all together. Or there's the red, white and blueberry salad which is all berries, chicken, cheese and a homemade honey mustard vinaigrette. 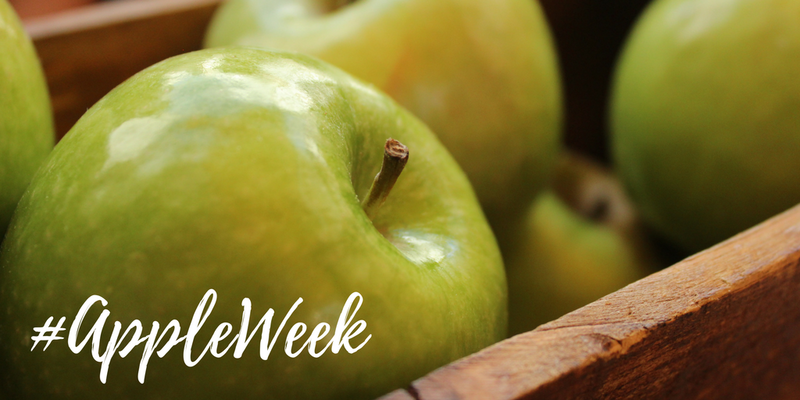 I think #appleweek is my favorite week in the blog. I hope you've had a chance to check out some of the other apple recipes. Mix all ingredients in a jar. Close lid securely and shake. Store in refrigerator and shake before use. Load your plate up with greens, top with remaining ingredients. My salad all the way! You know I LOVE honey crisp! So my husband is begging me to make your apple cake from this week! He saw it in Twitter, lol!! Can't wait! Well have this salad for dinner so you can have an extra big piece of cake!! Or little dude and I can come claim the bunk beds for a weekend in the new house when it's done and we can all have cake! 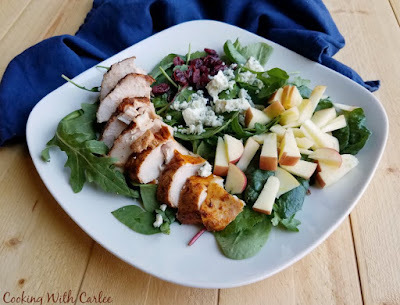 Fresh apples, savory blue cheese and chicken....what is not to love?! Those are my favorite salad toppers! Thanks, Wendy! This salad includes everything I love (well, not chocolate, but everything else). Cranberries and bleu cheese together make me swoon! The good thing is if you have a salad for dinner you can have some chocolate guilt free for dessert. I am pretty sure that's how the math works! Pops is grilling some chicken for my birthday dinner this weekend. I don't eat the sides I'm making so this will make a perfect meal to celebrate. I got my Craisins and honey crisp apples today. I'm all set and can't wait! Then you are all set and ready to go! 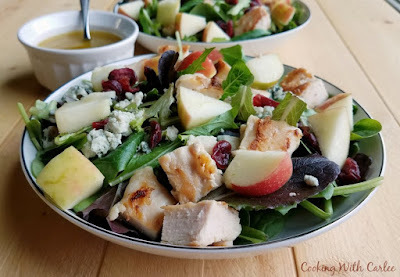 I love all the ingredients in your salad, especially the chicken and of course those amazing apples!!! Loving the crunch! It is funny that we both switched to salad on the same day. Thanks, Jas! 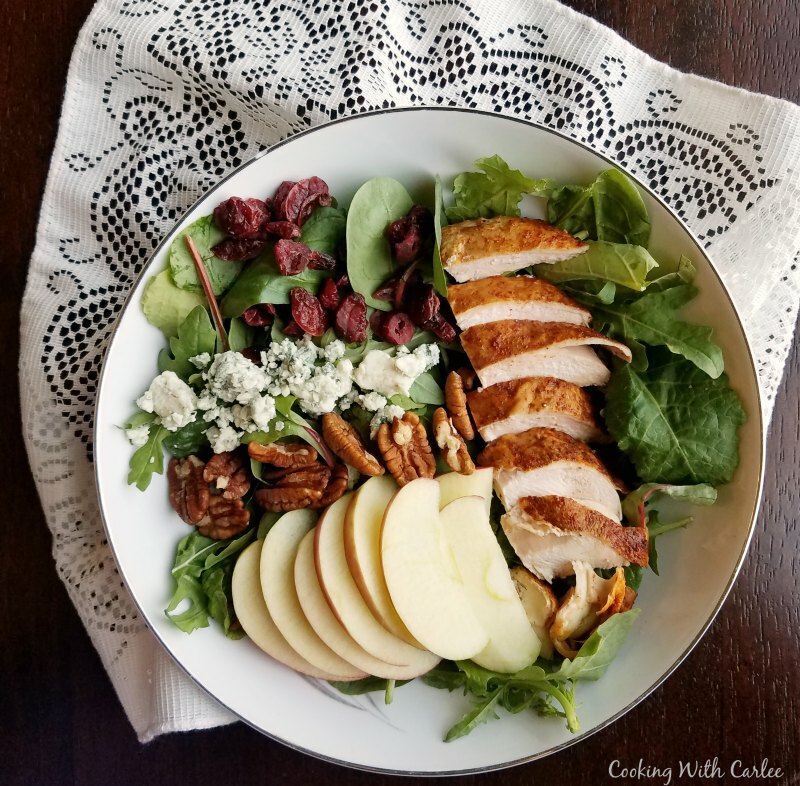 This is a delicious fall salad! Thanks so much for sharing your awesome post with us at Full Plate Thursday and come back soon! Mmmm... This is my kind of salad!! Sounds so good! Mine too! I had it an embarrassing number of days in a row for lunch! It's definitely my go to salad right now! Thanks, Val!